It’s the new year, and January is well underway – which means it’s the perfect time to think about snow and ice on the sidewalks of your property, both residential and commercial. It’s no surprise that slip and fall accidents occur most frequently in winter months, so be diligent in checking and clearing sidewalks and other walkways to prevent injury. Many people may assume the City of Yakima is responsible for clearing snow and ice from sidewalks, because they are available for everyone to use. However, that’s no longer the case. Beginning in 2014, many cities, including Yakima, have made it the property owner’s responsibility to keep sidewalks clear of snow and ice. 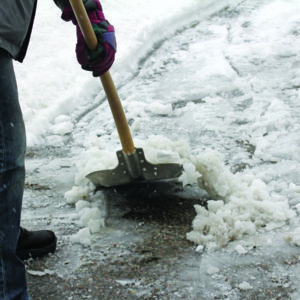 To review Yakima’s law regarding snow and ice removal, see Yakima Municipal Code, Chapter 8.88. The sidewalk is considered an extension of the owner’s property, whether it’s home or business. Property owners are responsible for their property, including sidewalks, right up to the street. The purpose of the law is to keep public rights-of-way safe, and requires property owners to make all reasonable efforts to clear sidewalks on their property. In Yakima, if your sidewalk is not cleared by 9 a.m. the next morning after a snowfall, you could be subject to a fine of up to $50.00, and each day is a new infraction. So, if the City shows up several days in a row and you have not cleared your sidewalk, the fines can really add up. In addition, it is also very important to keep your sidewalks clear of snow and ice to avoid being liable to others who may injure themselves on a snow and ice-covered sidewalk. It’s important to remember when you are clearing off the sidewalk in front of your property to avoid throwing the snow and ice into the street, as that’s also illegal. Be sure to pile the snow and ice somewhere out of the way and on your own property. See the City of Yakima’s list of helpful tips and policies regarding snow removal from sidewalks, driveways and streets, as well as a snow plow map. To protect yourself from personal liability in case someone does fall and is injured on a slippery sidewalk, it is important to make sure you have homeowner’s insurance that provides liability coverage. Homeowner’s liability coverage would pay for any damages the injured person sustains in a fall on the homeowner’s sidewalk. For 35 years, the attorneys of Abeyta Nelson Injury Law have handled slip and fall accidents resulting from an icy sidewalk or parking lot. If you have any questions or if you’d like to discuss your case, contact the attorneys of Abeyta Nelson Injury Law.